Contraindications to the laparoscopic approach are similar to those to open hernia repair (Table 1). 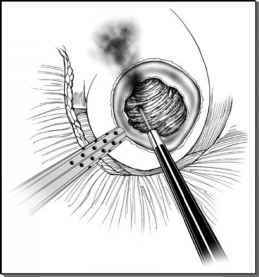 The most important consideration is the surgeon's experience in performing a laparoscopic repair. The learning curve for a transabdominal preperitoneal or totally extraperitoneal repair has been documented to be around 50 cases (7). TABLE 1 ■ Contraindications to been reports of patients undergoing a laparoscopic operation (mostly totally extraperitoneal approach) using a spinal and even at times a local anesthetic, these types of regional anesthesia may not give adequate abdominal relaxation or afford good pain control. Other contraindications are related to abdominal insufflation and subsequent cardiopulmonary compromise. Patients with significant pulmonary obstructive disease or significant cardiac dysfunction may not tolerate the increased abdominal pressure or deep sedation of general anesthetic. These patients would benefit from open herniorrhaphy using a regional or local anesthetic. Laparoscopic hernia repair may be contraindicated in male patients with elevated prostate specific antigen, and indication for prostatectomy as dissection in the preperitoneal space after laparoscopic hernia repair is difficult. Incarcerated hernias can be approached through a laparoscopic approach, but can be a challenge for the inexperienced laparoscopic surgeon. The manipulation of contents within the hernia sac and acute nature of incarceration (with possible bowel obstruction) may be difficult to reduce. In selected cases, general anesthetic and pneumo-peritoneum will allow for adequate abdominal wall relaxation with subsequent spontaneous reduction of the hernia. If spontaneous reduction does not occur, then the surgeon must be meticulous in reducing the bowel from within the hernia sac. Occasionally, opening the hernia sac and widening the neck of the defect will allow the surgeon to safely reduce its contents. Patients with chronic incarceration without mechanical bowel obstruction may be more amenable to the laparoscopic approach, given that less bowel dilation is encountered. Other factors that may make operating on an acute obstruction unsafe include difficult abdominal entry, inadequate space for pneumoperitoneum, and difficult handling of dilated bowel. Signs and symptoms of peritonitis may alert the surgeon of possible strangulation and bowel ischemia requiring bowel resection, which may be approached laparoscopically. Again, the difficulty is obtaining a safe pneumoperitoneum and handling dilated and possibly ischemic bowel. Newer instruments and stapling devices have allowed for complete intracorporeal bowel anastomosis. Mesh infection is the primary concern in these contaminated fields, and appropriate biomaterial choice is important. Gigantic scrotal hernias are difficult to approach laparoscopically. The difficulty is reducing the contents into the abdominal cavity while maintaining pneumoperi-toneum. Repairing the large floor defect of the inguinal canal may also pose a problem. These hernias may require a laparotomy as well as an inguinal incision for reduction of the contents and then adequate floor repair.